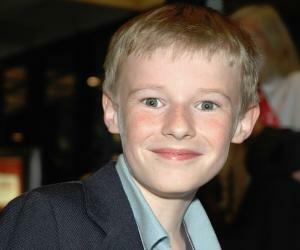 Kyle Catlett is an American child actor and voice artist. Check out this biography to know about his childhood, family life, achievements and fun facts about his life. 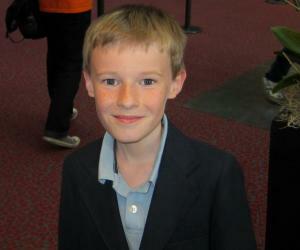 Kyle Catlett is an American child actor and voice artist. He rose to prominence for guest-starring as Henry Morton in the television medical drama series ‘Mercy’, in 2009. He is best known for his role of Joey Matthews on the Kevin Bacon-starrer series ‘The Following’. He also appeared in an episode of CBS’ ‘Unforgettable’. He made his big screen debut by playing the eponymous lead in the film ‘The Young and Prodigious T.S. Spivet’. He portrayed the character of Moische in the award-winning short film ‘The Pale of Settlement’. He was Griffin Bowen in the 2015 remake of the film ‘Poltergeist’. As of May 2017, some of his upcoming projects are the series ‘The Tick’ and ‘Bread and Games’. Kyle is multi-lingual with fluency in English, Russian, Chinese, and French, and a working knowledge of Spanish and Latin. He attended classes in the Chinese language in a Chinese school once a week and gave an interview in the language to ‘DingDing TV’. He learned Russian from his mother. Catlett has a modest presence on social media. He has just over a thousand followers on Twitter, and 700 people follow him on Instagram. Dedicated to his art and work, he hasn’t been active on either account for a while. The first role of Kyle Catlett’s career came about when he was just six years old. He was cast as Henry Morton in the episode ‘The Last Thing I Said Was’ of the NBC show ‘Mercy’. The episode aired on November 4, 2009. Two years later, he made his second appearance on TV when he played Max Seiferth in the episode ‘Heroes’ of CBS’ police procedural crime drama series ‘Unforgettable’. In 2012, he attended his first ‘Sundance Film Festival’ along with the cast of the short film ‘The Fort,’ in which he had played a role. He made his breakthrough with Fox’s ‘The Following’, in which he played Joey Matthews, the son of the character Joe Caroll. Beside Catlett, Bacon, and Purefoy, the series also starred Shawn Ashmore, Natalie Zea, and Valorie Curry, among others. It premiered on January 21, 2013, and the final episode aired on May 18, 2015. Catlett was a regular throughout the first season, appearing in all 15 episodes. Although the show was cancelled after four seasons, his performance was well-received, and it gave his career enough momentum for moving forward. While casting for the role of cartography prodigy, Tecumseh Sparrow Spivet, the director Jean-Pierre Jeunet (of Amélie fame) was looking for a child actor with “magical” quality. He said in an interview to ‘The Star’, “I don’t want someone cute; he has to have something special. It’s very difficult to say but when you see the kid, you have to have goose bumps. You have to fall in love with him.” After an international search that lasted months, Jeunet finally cast Kyle Catlett sometime in mid-2012. Speaking about his lead, Jeunet said to ‘IndieWire’, “It’s always the same story. You see thousands of kids and suddenly you have a surprise in front of you, by Skype now of course. My first reaction was, ‘He is too small, too little, too young. He is not T.S. Spivet.’” He further clarified, stating, “But when you have a kid who is a world champion in martial arts, he speaks five languages, and who is able to cry on command, you think, ‘Oh my God, this is an interesting kid. I have to meet him!’ Little by little he became T.S. Spivet.” The film also starred Helena Bonham Carter, Judy Davis, and Callum Keith Rennie. Catlett received a ‘Young Artist Award’ nomination for his role. His command over French was an immense help in conversing with Jeunet’s mostly-French crew. Catlett won the best actor award at the ‘Greenville International Film Festival’ in 2013 for playing Moische, a ten-year-old Jewish boy who escapes forced conscription into the Russian Army during the Crimean War, in the Russian-language short film ‘The Pale of Settlement’. 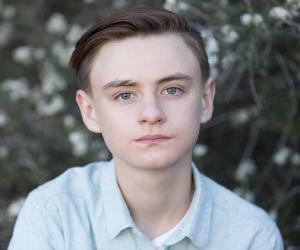 He received his second ‘Young Artists Award’ nomination for portraying Griffin Bowen in the supernatural horror film ‘Poltergeist’. Although the movie was critically panned, it was a minor hit at the box office. In 2016, he voiced the character of Jim in ‘The Angry Bird Movie’. 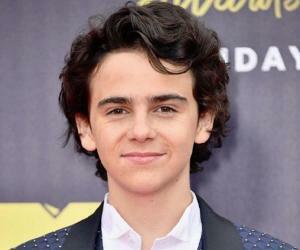 He is set to star as Young Arthur in the highly-anticipated ‘The Tick’ reboot. The show will premiere on Amazon Prime on August 25, 2017. Another of his projects releasing in 2017 is ‘Bread and Games’, where he shares the screen with Luis Guzmán and Phil Burke. 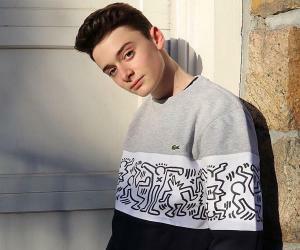 Catlett was born in the state of New Jersey, USA on November 16, 2002. He has a younger sister Leya who is also a child actress. She has appeared alongside Kyle in ‘The Pale of Settlement’, playing the role of Moische’s sister. Catlett is a diligent practitioner of various martial arts, and had won the Kung Fu world championship three times before he turned ten.